In this program, The 7 Habits?Mastery Series, you'll go beyond the 7 Habits and experience a deeper, more life-changing experience. With energy unique in presenting to a live audience, Dr. Covey will introduce you to a new level of leadership possible within everyone. Dr. Covey's approach to leadership and life is principle-centered, with an essential seriousness of purpose. Discover Stephen R. Covey's new framework for solving personal and professional challenges in our turbulent, troubled, complex world of change! The smooth current of business is history. Today, turbulence reigns in what Dr. Stephen R. Covey terms the "permanent whitewater world." We have whirlwinds of technological advances, changing tides of global, national, and local markets, merger storms, downsizing and structural changes - to name a few challenges we're faced with. In a world of political and economic upheaval and an accelerated rate of change and uncertainty, it is more crucial than ever to build leadership qualities in all people, regardless of job level or organizational status. In this program,The 7 Habits?Mastery Series, you'll go beyond the 7 Habits and experience a deeper, more life-changing experience. With energy unique in presenting to a live audience, Dr. Covey will introduce you to a new level of leadership possible within everyone. Dr. Covey's approach to leadership and life is principle-centered, with an essential seriousness of purpose. Whether you are a factory worker, CEO, middle manager, janitor, entrepreneur, or single parent, you can be a leader through personal moral authority. As you'll learn, "Leadership is a choice. Not a position." Cope better with your day-to-day challenges - and rise above your present circumstances! Unleash your creativity, resourcefulness, ingenuity, intelligence, and talent - including how to unleash other people's potential! Focus on your highest priorities - and achieve life balance! Create third alternatives and win/win solutions with people who have different views from you or who have clashing personalities! Build discipline, passion, a vision, and a conscience for yourself! Use the four roles of leadership to lead others successfully - especially in times of turbulent change! And much more! Dr. 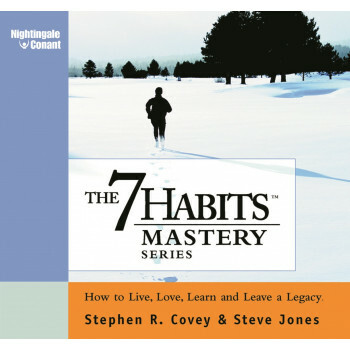 Covey says, "I'm convinced that the 7 Habits are increasingly relevant in today's turbulent, troubled, complex world of change. To live with change, to optimize change, you need principles that don't change." Join the millions of people who have already experienced these timeless, universal principles to meet life's challenges, rise above them and attain professional success and personal fulfillment in today's volatile, whitewater world!